NPSTW 2017 started out as an agency wide celebration and recognition of Suffield’s three (3) full-time and two (2) part-time Public Safety Dispatchers. The Police Chief’s Executive Assistant and Records Clerk had snuck in Sunday morning to decorate the Dispatch Communications Center with blue and gold balloons and streamers as well as images of cartoon superheroes, each to represent our own Public Safety Dispatcher heroes. A basket of snacks and treats was made for Dispatch staff on all three shifts to enjoy. Our marquee sign out in front of the Suffield Police Department on the busy thorough-fare of Rt. 168 was changed to acknowledge NPSTW. Each day, a different Public Safety Dispatcher was profiled on the SPD Facebook page with their photograph and a short biography. A media press release was distributed to over a dozen media organizations to promote this important week as well as to honor our own Public Safety Dispatchers. 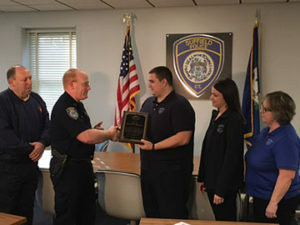 On Thursday April 13, 2017, the off going midnight Dispatcher, Nicholas Fasano, a brand new recruit Dispatcher he was field training, Lauren Mayhew, and the on-coming day shift Dispatcher Elizabeth Hayes all attended a brief ceremony inside the department during which Police Chief Richard Brown and Fire Chief Charles Flynn presented them a plaq ue to be posted in the Dispatch Communications Center. A television station was on hand to interview all present and to film the Dispatchers “in action” taking telephone calls and dispatching calls for service. This video piece was to air at 5:00 p.m. that night. 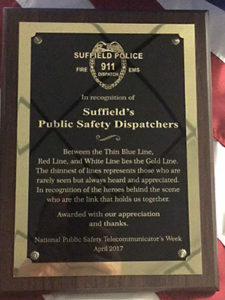 But that was not to be as Suffield’s Public Safety dispatchers were thrust into the middle of a major critical incident. him during the course of a traffic stop. The suspect was fatally injured. The officer was unharmed. Suffield’s Public Safety dispatchers then did what every dispatcher is trained for but few ever have to and all hope not to. Off-duty Dispatcher Mildred Webster, stopping by the department on an errand, jumped in to assist Dispatcher Hayes as the incident unfolded. Dispatcher Lorraine Morelli came in early for the evening shift and accompanied an officer to make notification to the officer’s partner as she knew her well as an acquaintance. Dispatcher Nick Fasano, having just come off duty from the midnight shift, and due back for the next midnight shift, came in to work so as to relieve Dispatcher Hayes to give the dispatcher that much needed time to decompress after the initial response to the critical incident. NPSTW 2017 went on and a slow return to normalcy began the following day on Friday April 14th as the agency regrouped, supported one another, and wrapped up NPSTW with the presentation of small gifts of water tumblers, pens, and other trinkets to each Public Safety Dispatcher by the Police Chief and Captain. 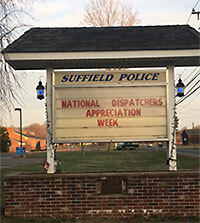 NPSTW 2017 for the Suffield, CT Police Department stands as a daily tribute to the professionalism and commitment of Suffield’s Public Safety Dispatchers as well as an example of the grim reality of what every telecommunicator might face on any given day.